14=12, 7=6 for arrivals until 14 June 2018. * The two offers can not be combined! Location: Panorama Hotel is one of the most attractive hotels in St. Vlas resort on the Black sea in Bulgaria. 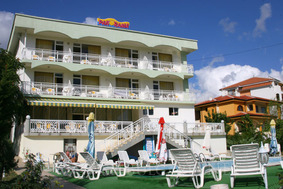 The hotel is situated just 60 m away from the beach line. Accommodation: Panorama hotel offers 22 double rooms and 2 apartments. All rooms offer breathtaking view towards the sea. The double rooms are luxuriously furnished and offer Air conditioning, satellite TV, mini bar, an individual bathroom with shower cubicle and terrace. The apartments offer a living room and individual bedroom. All apartments offer air conditioner, satellite TV, minibar, bathroom with bath tub and magnificent view towards the sea and the old Nessebar. Wine and dine: The restaurant of the hotel serves delicious local and international specialties. The breakfast is srved on a block table. The lobby bar of the hotel offers a wide range of cocktails and refreshing drinks. Sports and recreation: Hotel Panorama offers an outdoor swimming pool, children pool with water slide, children’s corner, room with games and karaoke, and happy hour offers. After a tiring day on the beach guests of the hotel can take advantage of the professional massages offered in the relax hall of the hotel.